Swashbucklers! 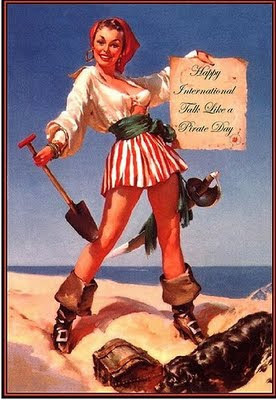 : International Talk like a Pirate Day! Aaargh! Sink me if it ain't Talk Like a Pirate Day today, by the powers, an choke me with a rammer! I be mortal glad to have at a pirate figure today or scupper me with a marlin-spike. The sands in the glass be runnin', so to the bench me hearties and damn me for a Spanish crustacean if we don't deliver, devil a doubt!